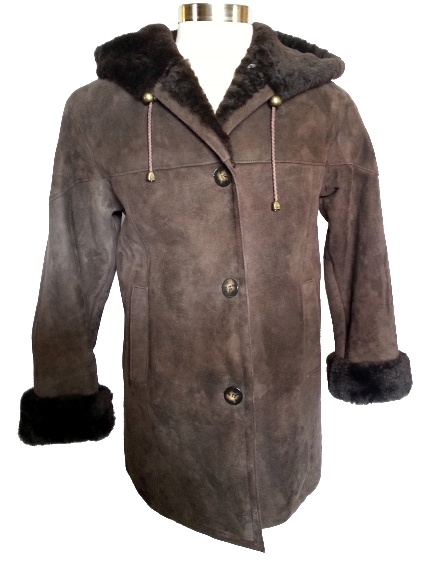 This hooded sheepskin coat is 3/4 length with closed seams and a nice big hood to keep you toasty and warm. Available in the Icelandic colors listed below. Features four buttons, slant pockets and adjustable cuffs. Approximately 33 to 34" in length. Icelandic pelts are a lighter weight, exceptionally soft and supple hide, with equally soft fur. X-Large (fits up to a 47" bust) $50 adtl. Copyright 1998-2012 VillageShop.com. All rights reserved worldwide.